After your total joint replacement surgery at UNM Health, you will receive instructions on how to treat the area once you are discharged from the hospital. If you are suffering from prolonged or severe dysfunction in your knee or hip, you should consider total joint replacement from UNM Health System. Our orthopaedic specialists at Sandoval Regional Medical Center (SRMC) perform approximately 600 such surgeries each year. We will look at x-rays, MRIs and other pertinent factors to determine if joint replacement is right for you. Partial and total knee replacements. Anterior and superior approaches to hip replacements. Shoulder and reverse shoulder replacements. We are on the cutting edge of the latest technologies, including systems like the Zipline closure system, which doesn't use staples or sutures. This means there will be less scarring and a smaller chance of infection. We are also working on our Joint Commission certification, which improves care, communication between team members, pain control, infection prevention and helps ensure patient safety. Our staff is dedicated to creating the safest possible environment for our patients. 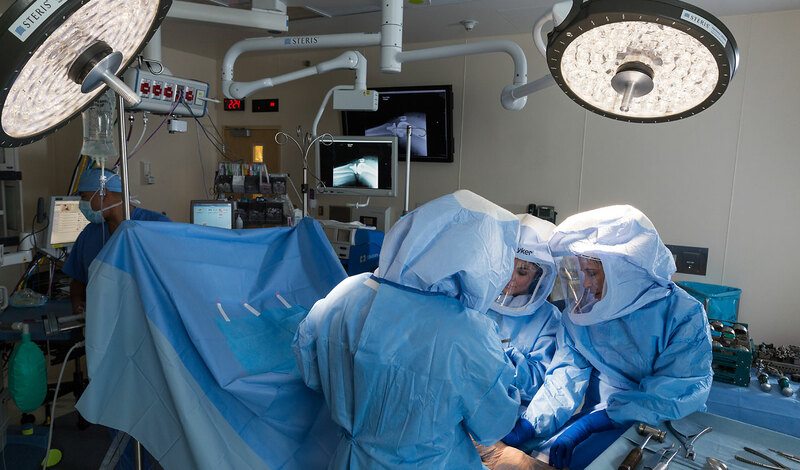 Our experienced surgical team will provide your surgical care in our state-of-the-art operating rooms. After surgery, you will be moved to a private room, generally on the fifth floor, with beautiful views of the either the Sandia Mountains or nearby surrounding open spaces. 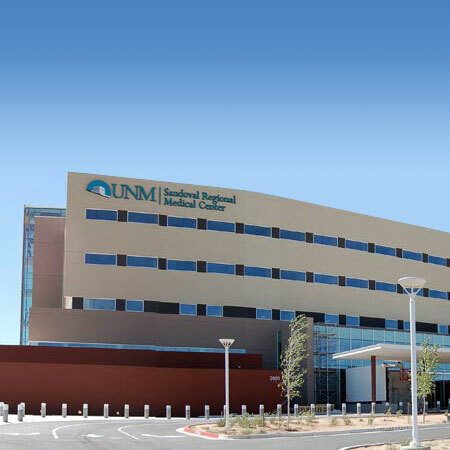 Every member of the UNM SRMC health care team looks forward to providing you with expert care to ensure that the first few days after your surgery are safe and productive. Below is a video detailing every aspect of joint replacement surgery at Sandoval Regional Medical Center. This is an invasive surgery where the damaged surfaces of the knee joint are removed from the surfaces of the bones and then shaped to hold a metal or plastic artificial joint (prosthesis). The artificial components are attached to the femur, patella and tibia using a special adhesive compound. Our joint coordinators will help guide you through the process, but you can read through our patient guide to total knee replacement. It will describe everything you need to know from your initial pre-op clearance to your release from the hospital and how to live a healthy life with your new joint. This is an invasive surgery where the affected parts of the hip joint are removed and replaced with new artificial parts (prosthesis). The goals of replacing the affected areas are to increase mobility, decrease pain and increase overall function of the hip joint. Our joint coordinators will help guide you through the process, but you can read through our patient guide to hip replacement. It will describe everything you need to know from your initial pre-op clearance to your release from the hospital and how to live a healthy life with your new joint. What is the Post-Op Timeline typically like? While it obviously depends on a number of variables, our goal is for patients to remain in the hospital for no more than two nights following their procedure (and shoulder patients usually remain just one night). Over 75 percent of our patients are then discharged home, as opposed to a transitional care facility or acute rehab center, and that number continues to climb. Outpatient physical therapy for six to 12 weeks following the procedure is common. What is a Joint Coordinator? Our joint coordinators are there for our patients from day one. They answer questions, help schedule and coordinate appointments and get any clearances they might need. From the time it is identified that they require surgery all the way through post-op recovery, we are there for them. If you have any questions about the program you can call 505-280-6819. If you have any questions or concerns about total joint replacement at UNM Health, or to see if you are a potential candidate, please call our joint coordinator at 505-280-6819. To schedule an appointment please call 505-272-4866.